In my never ending quest for he perfect slice I gave Curioso a shot: This place just opened up, so to be fair I have to give them some room as they were still getting their act together. I tried their veggie and white slices which were decent — the crust was nice and thin which is a plus in my book. The veggie slice was alright but not great (the ingredients took it down a notch with bland olives), so my hunch is that one should keep it simple when ordering there. The white slice was a bit better than the veggie slice, but again it was average. The staff was friendly (although slightly disorganized) and the space was huge. Although I should add that he prices were very reasonable for what you got. 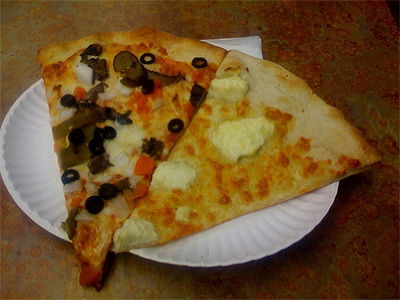 So my thinking is that if you live close by (i.e on the east side of the BQE) Curioso would be good for a fast slice. Although if you're not near by I wouldn't say that it was "destination worthy". But if you're wandering around the Burg and aren't far away it would make a good slice stop. This page contains a single entry from the blog posted on July 13, 2009 12:02 AM. The previous post in this blog was Gerry Esposito: An Endorsement for City Council. The next post in this blog is Spoonbill & Sugartown is Kid Friendly.